Background: Endoscopic ampullectomy has been recognized as a safe and reliable means to resect selective tumors of the ampulla of Vater and is associated with lower morbidity and mortality rates compared to surgical resection. Success rates range from 42 to 92%, with recurrences reported in up to 33%. Studies on endoscopic resection of advanced lesions such as those with intraductal extension of adenoma (IEA) and lateral spreading adenomas (LSA) are limited. 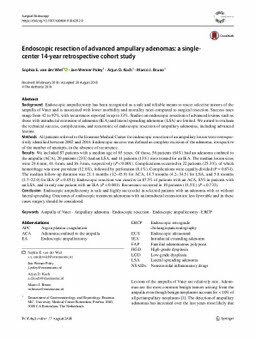 We aimed to evaluate the technical success, complications, and recurrence of endoscopic resection of ampullary adenomas, including advanced lesions. Methods: All patients referred to the Erasmus Medical Center for endoscopic resection of an ampullary lesion were retrospectively identified between 2002 and 2016. Endoscopic success was defined as complete excision of the adenoma, irrespective of the number of attempts, in the absence of recurrence. Results: We included 87 patients with a median age of 65 years. Of these, 56 patients (64%) had an adenoma confined to the ampulla (ACA), 20 patients (23%) had an LSA, and 11 patients (13%) were treated for an IEA. The median lesion sizes were 24.6 mm, 41.4 mm, and 16.3 mm, respectively (P < 0.001). Complications occurred in 22 patients (25.3%), of which hemorrhage was most prevalent (12.6%), followed by perforation (8.1%). Complications were equally divided (P = 0.874). The median follow-up duration was 21.1 months (12–45.9) for ACA, 14.7 months (4.2–34.5) for LSA, and 5.8 months (3.7–22.0) for IEA (P = 0.051). Endoscopic resection was curative in 87.5% of patients with an ACA, 85% in patients with an LSA, and in only one patient with an IEA (P < 0.001). Recurrence occurred in 10 patients (11.5%) (P = 0.733). Conclusion: Endoscopic ampullectomy is safe and highly successful in selected patients with an adenoma with or without lateral spreading. Outcomes of endoscopic treatment adenomas with an intraductal extension are less favorable and in these cases surgery should be considered.